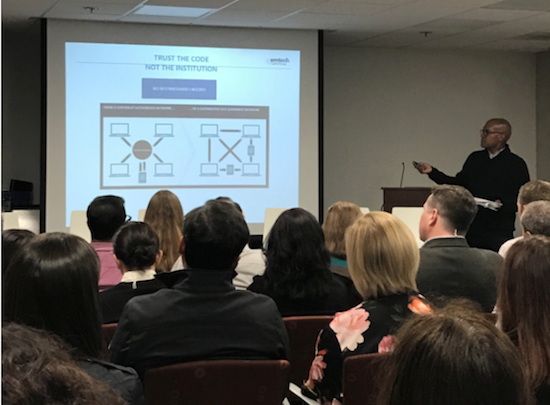 Recap of the WITI event on March 22nd, 2018 titled "Blockchain, Cryptocurrency, and ICOs"
Let's first give thanks to our sponsor Solugenix for supporting WITI in general and funding this event in particular. 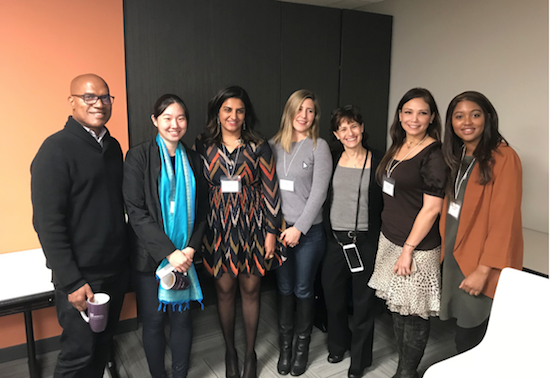 Solugenix is an employee owned company and with over 42% women in senior leadership positions, Solugenix leads by example in their commitment to diversity. > Heidi Pease is cofounder of Los Angeles (UCLA/USC/UCI/City of LA) Blockchain Lab and CEO/Cofounder of Proof of Art, a blockchain project that helps fund and promote artists. > Sheri Kaiserman is Cofounder of Maco.la, formed to support the growing blockchain ecosystem with a 3 pronged approach of providing capital, advisory, and talent. Prior to Maco.la, Sheri spent 16 years as Head of Equities at Wedbush. She commissioned the first research report on Wall Street on the topic of Bitcoin and blockchain in 2013. > McKenzie Slaughter is founder/CEO of Prohaus Capital, a fintech and blockchain venture capital firm currently raising $80M blockchain for impact fund. She is the Founding Capital Partner for Beyond Capital Markets. > Rahilla Zafar is the author of Internet of Women - Accelerating Culture Change, and is Managing Director of ConsenSys, a leading blockchain company. > Veronica Reynolds is a second year student at UCLA School of Law, where she is currently researching government adoption of blockchain. She has been involved in the blockchain space since 2014. > Amy Y. Wan is Founder and CEO of Sagewise, a smart contract dispute resolution infrastructure for smart contracts. Amy is also founder and co-organizer of Legal Hackers LA, an intersection of law and technology. The event was conducted as a panel discussion with moderator Rohan Hall, entrepreneur, investor, published author, speaker and leader in the blockchain ecosystem. Rohan works at Capital Group where his focus is to bring innovation to the Financial Services sector via blockchain. Rohan kicked off the event with an overview of foundational know-how behind bitcoin, in particular blockchain. It is blockchain that makes Bitcoin remarkable. Blockchain will be one of the most impactful technologies in the upcoming years. It is a protocol we can built applications on top of - much like the internet. Blockchain, like the internet, is a foundational technology. Blockchain is a continuously growing list of records called 'blocks', that makes it possible to instantly record and transmit value. How does blockchain work? Blockchain is a form of the distributed ledger technology. Remember your bank statement? That is a form of a ledger - it is a record of credits, debits, and balances. Similarly distributed ledger consists of linked batches of transactions known as blocks and an identical copy is stored on each computer within a network. This creates a new type of 'database' that is decentralized compared to a centralized database such as SQL Server, Oracle, or Amazon RDS where all transactions reside in one database. Bitcoin is the first large scale application of blockchain protocol. Decentralized aspect of blockchain gives Bitcoin its resistance to 'hacking' (for nearly a decade now). It is not easy to hack 51% of the Bitcoin servers at the same time. Meanwhile, we saw central institutions whom we trusted with our data (using centralized databases) get hacked and our data stolen. Case in point, Equifax, and unfortunately there are many others. Blockchain also provides verification without intrusion. Blockchain has built in security via various consensus mechanisms and cryptographic methods. A transaction is authenticated by being accepted by the blockchain and miners verify it through a "proof of work." And, since the blockchain is an open public ledger, everyone can trace the history and be assured of a transaction's accuracy. Transparency and cryptographic proof replace the need to trust. Blockchain is just starting and its journey will be similar to the journey the Internet went through. Blockchain opens up many new opportunities. Financial institutions have been a practical necessity for transferring wealth over distance. Now blockchain eliminates the need for a trusted third party. We have a huge part of the world without access to financial services. This opens up a new financial inclusion to people without identity. Panelists pointed out how world is racing ahead with blockchain. Dubai is the first government to launch blockchain as a service. Discussion turned to ICOs (initial coin offering) and how ICO's already disrupt traditional VCs. ICOs offer a way to invest into blockchain projects. Over $5B was funded through ICOs in 2017. The site https://www.worldcoinindex.com/ is good one for watching the movements of various blockchain projects. Are ICOs credible way to invest? It depends. Yes, there are people who are called whales, because they invested into bitcoin early on and got super rich. But still a lot of maturing needs to be done. "Do your research!" was advice from the panelists. Some ICO projects are shams designed to pump money from participants and then dump it. Nobody should think (s)he can enter the ICO ecosystem as a lazy investor without a deep due diligence. How about regulation of ICOs? Panelists noted the SEC is starting to step up however regulators are in the phase of collecting information. They are prudent and regulatory infrastructure is not set up, yet. ICOs promote capital formation and SEC needs to balance priorities carefully. Strict regulations could put the US behind in using blockchain. We are observing a new financial revolution. It is no coincidence that the coding of Bitcoin began in 2007. The financial crisis of 2007-2008 is often viewed as the worst one to occur since the Great Depression. The 2007 crisis is a cautionary tale of how dangerous it is to empower trusted third parties. The hierarchy of trusted third parties not only failed in its fiduciary duty but also passed-on the cost of failure to taxpayers. Brain trust behind Bitcoin is an unknown person or group of people named Satoshi Nakamoto and they argued Bitcoin is going to be one of the major forces in reducing the role of government. On the other side it is not OK for people to randomly lose money in ICOs and it is good that the US government is carefully evaluating regulatory options including possibly creating a new separate regulatory body. Right now very few women are participating in blockchain projects, only 7% of crypto sphere consists of women. Panelists quoted Sheryl Sandberg: It is time to Lean in! Apply for the jobs in the blockchain ecosystem! Become a mentor and role model to young people! Blockchain projects give power to regular people and they can be used for a significant social impact. It is a new way to enter the entrepreneur market and raise money. In conclusion, the blockchain has no self-interest. It is not owned by one person or one company or one government. Its information is immutable and secured by cryptography. It brings new solutions and new questions. Who are we going to trust? Central Institutions? Or will we trust the code? Who is the team behind ICO? Do I believe in their project? So many intriguing questions to ponder! On behalf of WITI, I want to thank again the panelists and audience for a mind stimulating evening. I look forward to see you during our future events!